Colosseum Heroes is all about the benjamins. This 2D action game wastes no time displaying things you cannot afford. As soon as you select a character (knight or vampire), creator Gamevil whisks you to an armory full of expensive weapons, armor and spells, basically implying that all this and more can be yours if the price is right. Hey, it makes sense. These days, it seems like every iPhone and iPad game comes with in-app purchases. Just the nature of the beast, so to speak. What annoys us about this title is the penalty for dying. Croak, and the App steals the gold accumulated in that round, forcing you to endure a painful restart while the developers dangle a revive without penalty above your head, for a price, of course. That's not just mean, it's greedy. It's a shame the ominous black cloud of money hangs over Colosseum Heroes, because it's a decent hack-an-slash worth the initial $0.99 investment. 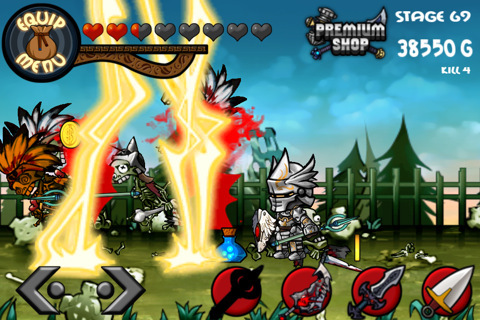 Each character possesses a unique set of equipment and upgrades, making for two different experiences. What's more, the game has a great selection of monsters to slaughter, including orcs, skeleton warriors and wolves just begging for a beat down. That said, there's little more to the game than entering an arena, pummeling creatures, gathering as much gold as possible and then advancing to the next stage. No cut scenes or story to speak of. Ultimately, that makes Colosseum Heroes repetitive, especially since it takes forever to earn enough gold to unlock the good stuff, unless you fork over anywhere between $0.99 and $49.99 for more; again, common practice in games like this. To that end, this is a good, but not great, beat-em-up always looking for a handout. You don't have to pay. At the same time, you probably won't have as much fun if you don't. 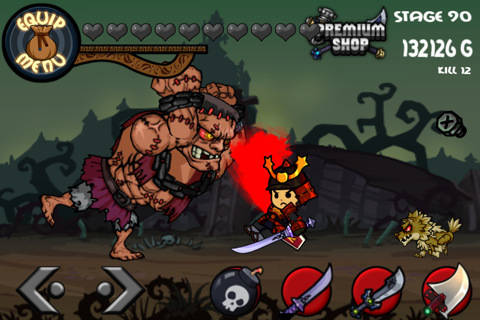 What's Hot: Nice variety of monsters, satisfying hack-an-slash play, cartoon-style 2D graphics, two unique characters to choose from. What's Not: Losing gold after death, grinding to afford the coolest gear, the constant request for cash.